SLO Town does St. Paddy's Day! 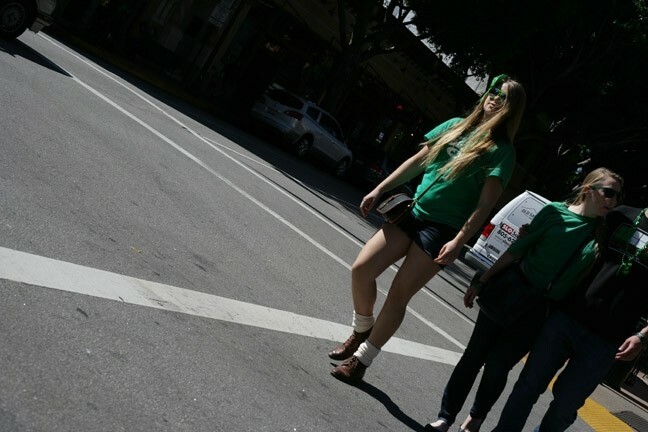 DROVES: Lots of green-clad kids wandered and stumbled through downtown SLO, though crowds were thinner this year than last, in part because St. Paddy’s Day fell on the first day of Cal Poly’s finals week. I don’t speak Irish Celtic, but thanks to the Internet, I learned that Caochta (pronounced quake-tah) means “wasted.” I also discovered Céard is ainm duit (kayrd iss ann-im ditch) means “What’s your name?” and that “Tú ag iarraidh dul liom” (too egg eerie dull lum) means “Wanna go home with me?” Most importantly, I’ve learned that Celts spell things really weird! It’s Monday, March 17, also known as St. Patrick’s Day, an American holiday in which people wear green and get sauced all day long. OK, technically it’s an Irish religious feast day devoted to Ireland’s patron saint, but that’s not the way we do it. It’s Bagel Monday at New Times, so I start my day with an egg bagel with green smear, just to get into the spirit, and then I leave our Marsh Street office and start making my way south to all the bars. I only get two blocks, to the corner of Higuera and Chorro, when I spot them: green clad kids laughing and stumbling and carrying on. Ah, youth! “Come over here! Come over here!” screams a dude in a green stovepipe hat to a young gal across the street in gold and green plastic beads. 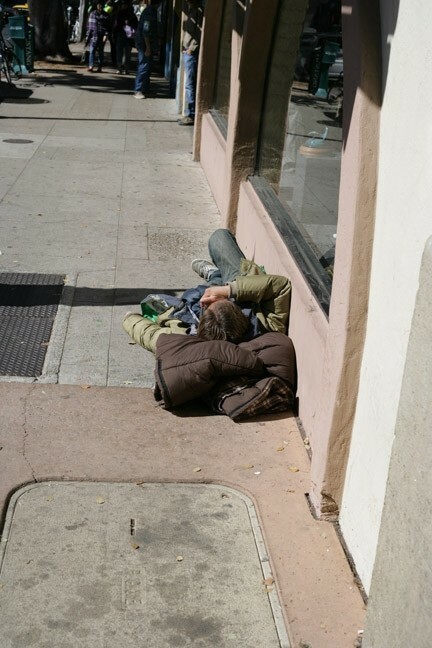 THIS LOOKS LIKE A GOOD PLACE TO SLEEP: OK, technically this could just be a homeless guy, but I couldn’t find any passed-out drunk kids. This doorman seems really smart. Maybe he’ll meet the one-drink-of-water girl. I think they could be very happy together. Finally I get to McCarthy’s Irish Pub and I see Steven Damasco working the door, even though it’s his 35th birthday. “Happy Birthday, Steve,” I say. FRIENDS IN NEED: John Parker wheels his friend Joe Halpen into McCarthy’s around 11 a.m. on Monday, March 17. “Pretty mellow so far, but I’m thinking it will pick up later when the students get out of classes,” Steve says. Then I see Teresa Schmidt, who’s working on a face painting design on Laurel White, whom I’ve known for years. “Don’t tell my husband I’m down here,” Laurel says. “Who do you work for?” Teresa asks. 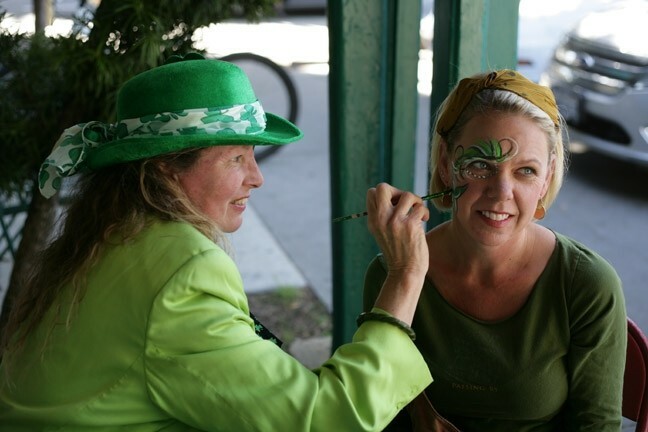 GET YOUR SPIRIT ON: Longtime face painter Teresa Schmidt (481-5093) set up shop in front of McCarthy’s Irish Pub, here painting Laurel White. 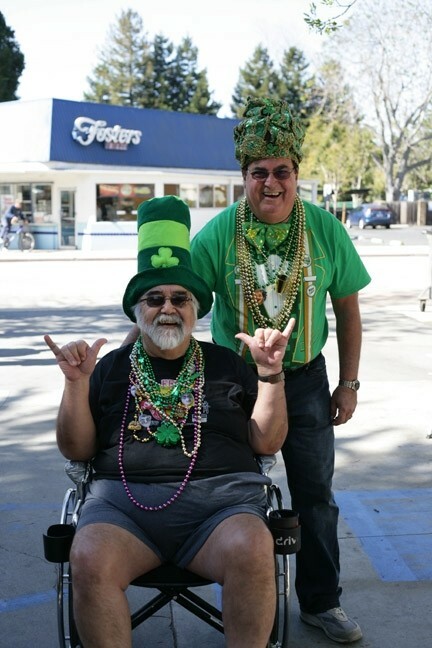 I’m fixing to head back to work when I see John Parker pushing his wheelchair-bound friend Joe Halpen into McCarthy’s, proving you’re never too old to drink a green beer at 11 a.m. I take their photo and tell them to have fun. OK! Sláinte! 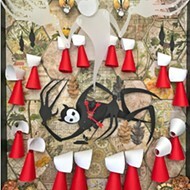 Oh, that’s pronounced slawn-cha and means “cheers!” Learn to spell, you crazy Irishmen!